The amazing geodata portal at King’s College London, unveiled early last week, has just gotten better. First, the site’s layout has been overhauled, and a lot of the layers have been written up. 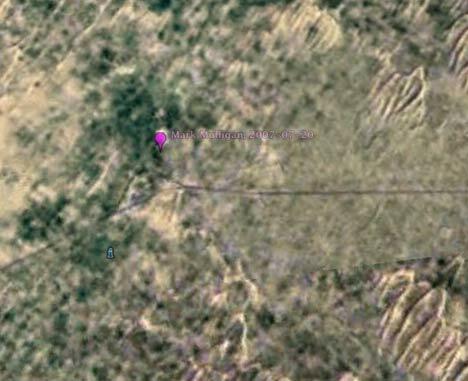 Terrascope brings some history to Google Earth. Google Earth imagery is largely made up of the NASA Circa 2000 LANDSAT Mosaic (processed very well by TerraMetrics) with Digital Globe and other higher resolution imagery (largely post-2000 in origin) added for large parts of Europe and the US and for cities and other areas of interest across much of the rest of the world. I have added the public domain LANDSAT MSS Mosaic (circa 1975) and the LANDSAT TM Mosaic (1990) for most of the world. I am also running the LANDSAT 2000 Mosaic and adding that for parts of the world so that — as Google update their imagery — the following history will be visible : (all circa) 1975, 1990, 2000 and Google native (post 2000). The aim is to help visualise land cover change in a simple way (alongside some of the other databases at www.kcl.ac.uk/geodata). The images have been converted to ‘natural’ colour. Invariably the data quality and resolution are reduced as we go back in time and some parts of the globe are missing for various reasons, including the degradation of data storage media at the LANDSAT stations, but nevertheless a useful simple visiualisation is possible. But it’s not just data that Mark is serving, there is also metadata: Both the coverage area for each year and the metadata for individual tiles can be turned on, just like how professional geographers want it. And there’s more! There is a database of place names added to the layer that manages to find ample names for even the smallest features in the middle of nowhere, linked to a Google search. This by itself is a great resource. 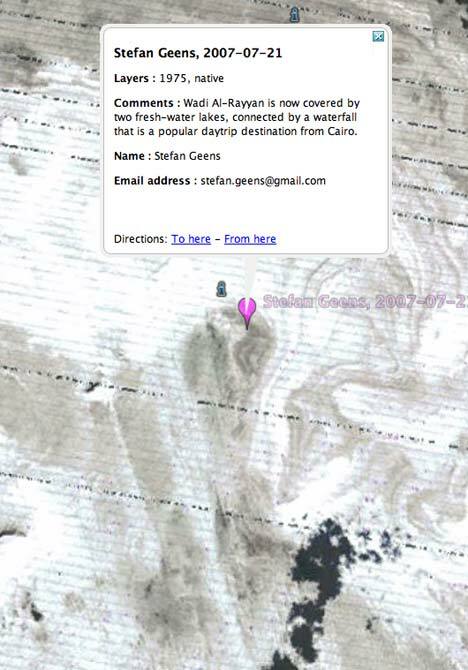 But perhaps the most innovative feature is the addition of a geowiki to Terrascope. 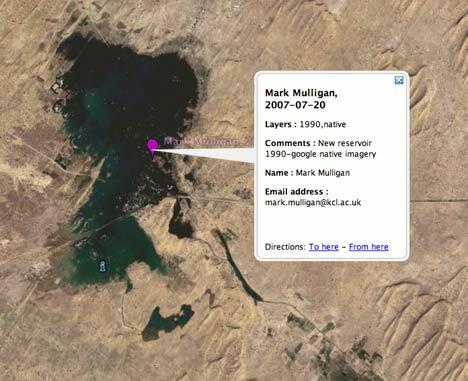 Google Earth’s default imagery has the Google Earth Community layer to which people can post interesting finds. Terrascope comes with its own version of this, so that the exploration of the LANDSAT mosaics can be done socially as well. 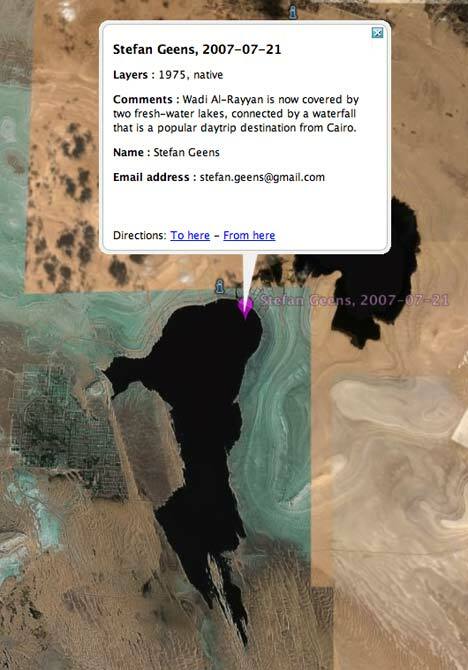 The geowiki is very easy to use. Turn it on, center a location, click on the crosshairs, get whisked to a web page, fill in the details, and refresh the wiki. Done. Surfing through time as well as space is proving mighty addictive. Augmented reality meets Google Earth, and we get a glimpse of what future virtual globes will be doing natively.